Dina Kowal Creative: some really SWEET candy! Our internet was out all day yesterday, and this week has been busy - training in a new helper, spending time with a friend, organizing homeschool books, and welcoming new students... anyway, if you missed me, that's where I was! The winner of last week's Impression Obsession stamps is...... SANDY @ Just a Little Stamping! (OK, that is weird...my other 2 winners' names were Sandra and...Sandra.) Sandy, be sure to send me your address so I can get these stamps out to you. I love that this image is sooooo easy to match to any color combination or DP. The card below was colored using LePlume II Markers and a waterbrush. Check out the close-up on that rock candy - after I painted it I covered it with Diamond Dust...it sparkles like crazy, because it's actually crushed glass. Such cool stuff! Love it. Dina your coloring just fantastic! Thank you for week's prize!!! Dina...thank you!! I have never won a blog candy before so this is a real treat. I really love the IO stamps! Can't wait to stamp with these when I get them. Gorgeous coloring, Dina - thanks for a chance to win it! The yummiest piece of blog candy I have ever seen. Your colouring is fantastic too. Ooh ! I love this image and the card you made from it - so cool ! Thanks for the opportuntity ! I agree. This set is great! I would love to win it! I enjoyed seeing this beautiful card tht you made with it! Dina, this card is just awesome! Thanks so much for being willing to share your talent with us all. We are blessed! I love checking out your blog to see what you have been up to...in creating cards, and in your ministry! Thanks for the chance to win such a "sweet" set! Great, great watercoloring - I love those bold colors you used. It looks so yummy!! Congrats to the winner! WoW this stamp set is SWEET and what fun you could have with this set. Your card is so fun and bright. Thanks for a chance and for the inspiration you give me everyday. What a happy colorful card! Makes me smile! Love it! This reminds me so much of my youth and all the candy jars at the penny candy counter. Nothing sweeter!! Congrats to Sandy, and thanks for the chance to win the adorable candy collection. You're right... this could go with any paper! I really love the designs & the sentiments. Thanks for a chance to win! and you know, Sandra is a great name! Love your card! I really like the way the rock candy looks so real. How about a Sandie for your list. 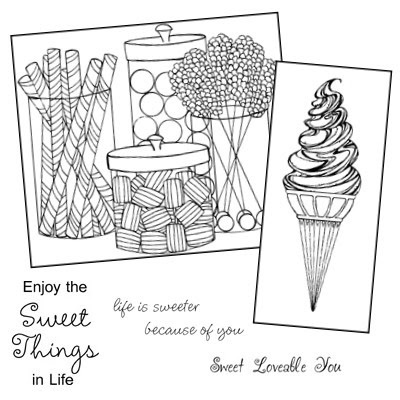 Love those "sweet" stamps and your coloring on them. Mmmm...gotta find me some sugar!! I was a "paper-girl" and had far too many dimes to spend on candy. I still can't resist the stuff. This set sure makes me drool! Your blog candy looks fabulous with your coloring- beautiful! I am loving these sets. Love that you share your talent! Lucky me! What a sweet set! (pun intended!) I love your card. Yummy blog candy! I love your coloring and added dimension on the candy sticks..beautiful card! Love these stamps and what you did with them. This is super SWEET! Love your rock candy!!!! these images are darling and look like so much fun to color. Thank you for the chance to win!! Thank you for your generous offer to all of this with the opportunity to win this prize. The images are awesome. I love the colors that you chose. These are just fantastic! Would love to play with them! I really like the lolly stamps & my Mum loves your Impression Obsession Christmas tree card. LOVED rock candy as a kid, never thought to use diamond dust like that, awesome!! Cute stamps! Thanks so much for the chance to win. I think that ice cream one would come in handy and the candy jars are neat too. The diamond dust makes it look so real...I want one now..thank for this week's prize! Wow, my comment # is almost my age, yikes! I love sweet things! Thank you for your beautiful colored example.